Abstract. Ozonolysis of monoterpenes is an important source of atmospheric biogenic secondary organic aerosol (BSOA). While enhanced BSOA formation has been associated with sulfate-rich conditions, the underlying mechanisms remain poorly understood. In this work, the interactions between SO2 and reactive intermediates from monoterpene ozonolysis were investigated under different humidity conditions (10% vs. 50%). Chamber experiments were conducted with ozonolysis of α-pinene or limonene in the presence of SO2. Limonene SOA formation was enhanced in the presence of SO2, while no significant changes in SOA yields were observed during α-pinene ozonolysis. 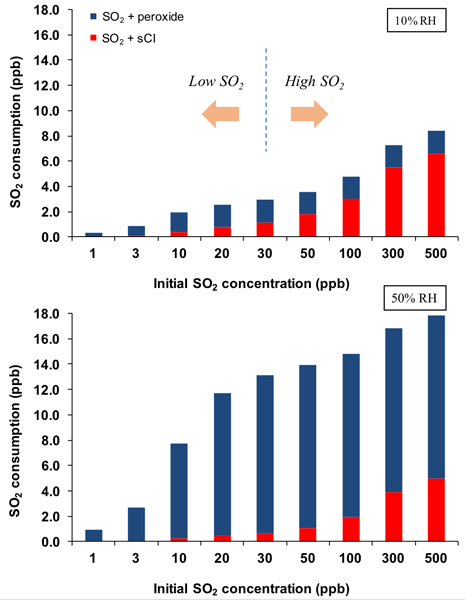 Under dry conditions, SO2 primarily reacted with stabilized Criegee intermediates (sCIs) produced from ozonolysis, but at 50% RH heterogeneous uptake of SO2 onto organic aerosol was found to be the dominant sink of SO2, likely owing to reactions between SO2 and organic peroxides. This SO2 loss mechanism to organic peroxides in SOA has not previously been identified in experimental chamber studies. Organosulfates were detected and identified using an electrospray ionization–ion mobility spectrometry–high-resolution time-of-flight mass spectrometer (ESI-IMS-TOF) when SO2 was present in the experiments. 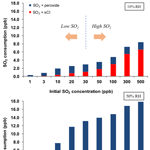 Our results demonstrate the synergistic effects between BSOA formation and SO2 oxidation through sCI chemistry and SO2 uptake onto organic aerosol and illustrate the importance of considering the chemistry of organic and sulfur-containing compounds holistically to properly account for their reactive sinks. How to cite: Ye, J., Abbatt, J. P. D., and Chan, A. W. H.: Novel pathway of SO2 oxidation in the atmosphere: reactions with monoterpene ozonolysis intermediates and secondary organic aerosol, Atmos. Chem. Phys., 18, 5549-5565, https://doi.org/10.5194/acp-18-5549-2018, 2018. Synergistic effects between SOA formation and SO2 oxidation through Criegee chemistry and reactive uptake by organic peroxides were observed. The relative importance of these two pathways (Criegee vs. peroxide) varies with relative humidity. The latter SO2 loss mechanism to organic peroxides in SOA has not previously been identified. Our results suggest a new pathway of atmospheric SO2 oxidation, which may contribute to the missing mechanisms of high-sulfate production in the polluted areas.